I'm appreciating the silence. Almost a month ago, when I was first laid off, silence was a terrifying thing. Most days were spent trying to pass the time, waiting for "A" to come home, waiting to go to sleep. That first week was so empty and silent that I tried to fill it with everything. Podcasts were playing, music was droning on and the TV was a magic pill of time wasting. Not knowing how long unemployment is going to last, I've been slowing learning to appreciate it. Instead of sleeping in, I wake up at the same time as "A" (well… I at least try and roll out of bed to eat breakfast with him) and take in the morning. Sipping my coffee in silence with a magazine. Or a book. Sometimes it's even just a good blog post I never had time to read. Most importantly, I've been cutting out the noise and it's helped with my stress. During the day, I tried not to watch any TV (on my computer or otherwise) and save the rock-out sessions for later in the day. I don't know why this works, but it does, and I'm not the one to fight it. It hasn't been the easiest month, but I've found a way to make it somewhat better. Yet the best unexpected benefit to all my free time is how much it's forced me into cooking creatively. When I was unemployed back in Seattle, I lived alone and only had myself to feed. This led to many a nights of canned soup and popcorn. I didn't judge myself! But now that I am a proper "kept woman," I have "A" bottomless pit stomach to feed. I never thought I'd say this, but that challenge is fun. To cut back on costs, we've been grocery shopping less, buying more from the discount bins at the coop and relying more on seasonal/whole foods. We already did that before, but now we're doing it even more. I still run over to the coop for a bulk ingredient or two, but I mostly make do with what's already in the kitchen. Each night, it's something new and exciting. There are usually always leftovers which means "A" can have a nutritious lunch at work the next day. And I get more material for my blog (albeit, still with improper lighting… damn you winter!). What's a girl to do with the dregs of a pantry and fridge but a mini-family to feed? Polenta. Comforting, warm and easy to whip up when I lose track of time. 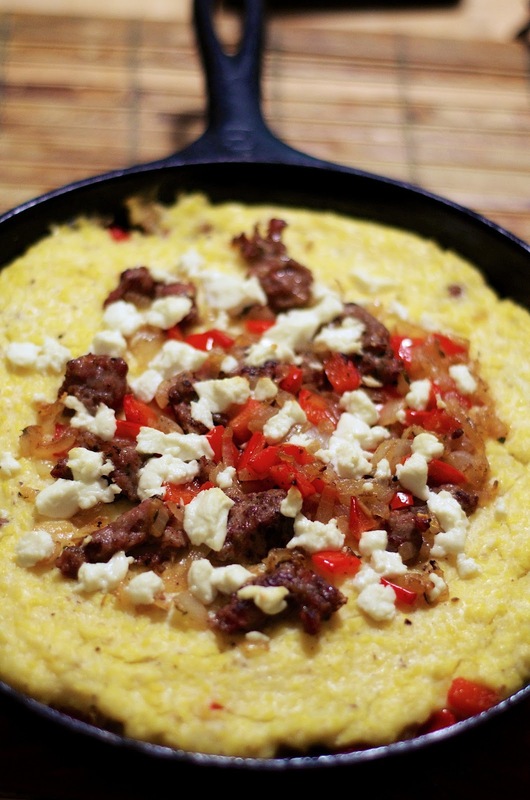 Pour 1/2 tablespoon oil into a cast iron skillet and brown sausage, over medium-high heat. Pour sausage into a mixing bowl and set aside. Drain excess oil from pan. Pour remaining oil into the skillet and add bell pepper, onion, garlic and thyme and sauté for 3 to 4 minutes, or until vegetables have softened. Season with salt and pepper. Pour vegetable mixture over sausage and fold together. Set aside. Pour water into a medium saucepan and bring to a boil. Generously season water with salt and pepper. Whisk cornmeal into water and reduce heat to medium. Continuously stir the polenta for about 5 minutes. Add butter, goat cheese and pecorino romano and stir until fully incorporated. Adjust seasonings. Lightly grease the skillet used to sauté the sausage and vegetables. 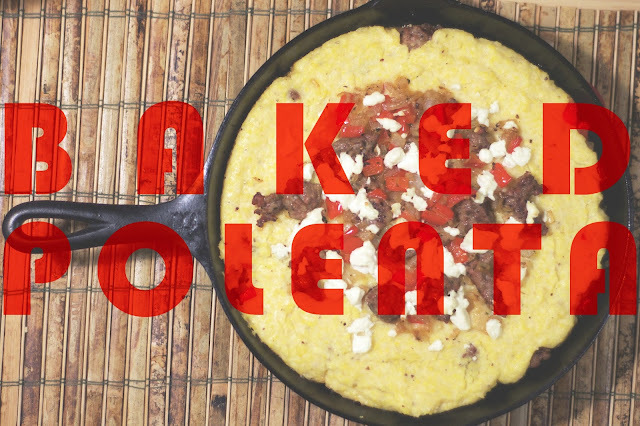 Pour half the polenta into the skillet and spread into an even layer. Pour all but 1/2 cup of the sausage/mushroom mixture, in an even layer, over the polenta and top with remaining polenta (creating almost a layered casserole). 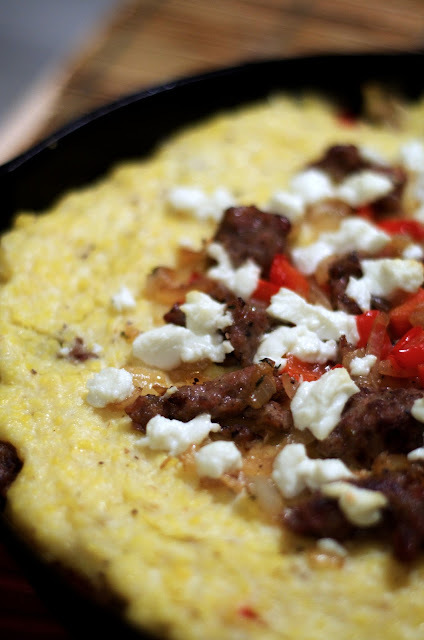 Sprinkle the top with the remaining sausage/vegetable mixture and crumbled goat cheese and bake for 20 to 25 minutes. Allow to cool for about 10 minutes. Serve.